Theresa May has written to the European Union to request a further delay to Brexit until 30 June. The government has been in talks with the Labour Party to try and find a compromise to put to the Commons. But shadow Brexit secretary Sir Keir Starmer said the Tory negotiating team had offered no changes to Mrs May's original deal. The PM said from the outset she wanted to keep her withdrawal agreement as part of any plan, but was willing to discuss the UK's future relationship with the EU - addressed in the deal's political declaration. Sir Keir said the government was "not countenancing any change to the actual wording of the political declaration", adding: "Compromise requires change." 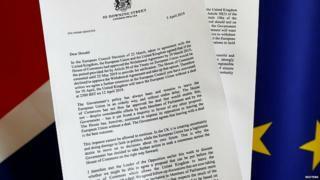 What does Brexit delay letter say? The prime minister has proposed that if UK MPs approve a deal in time, the UK should be able to leave before European Parliamentary elections on 23 May. The BBC's Europe editor Katya Adler has been told by a senior EU source that European Council President Donald Tusk will propose a 12-month "flexible" extension to Brexit, with the option of cutting it short, if the UK Parliament ratifies a deal. But French President Emmanuel Macron's office said on Friday that it was "premature" to consider another delay while French diplomatic sources described Mr Tusk's suggestion as a "clumsy test balloon". The prime minister wrote to Mr Tusk to request the extension ahead of an EU summit on 10 April, where EU leaders would have to unanimously agree on any plan to delay the UK's departure. Mrs May has already requested an extension to the end of June but this was rejected at a summit last month. Instead, she was offered a short delay to 12 April - the date by which the UK must say whether it intends to take part in the European Parliamentary elections - or until 22 May, if UK MPs had approved the withdrawal deal negotiated with the EU. They voted it down for a third time last week. A Downing Street spokesman said there were "different circumstances now" and the prime minister "has been clear she is seeking a short extension". The 30 June date is significant. It's the day before the new European Parliament will hold its first session. So the logic is, that it would allow the UK a bit longer to seal a deal - but without the need for British MEPs to take their seats in a parliament that the UK electorate had voted to leave as long ago as 2016. But, this being Theresa May, it's a plan she has previously proposed - and which has already been rejected. It's likely the EU will reject it again and offer a longer extension, with the ability to leave earlier if Parliament agrees a deal. But by asking for a relatively short extension - even if she is unsuccessful - the prime minister will be hoping to escape the ire of some of her Brexit-supporting backbenchers who are champing at the bit to leave. And she will try to signal to Leave-supporting voters that her choice is to get out of the EU as soon as is practicable - and that a longer extension will be something that is forced upon her, rather than something which she embraces. In her letter, the prime minister says she would continue to seek the "rapid approval" of the withdrawal agreement and a "shared vision" for the future relationship between the UK and EU. She said if cross-party talks with the Labour Party could not establish "a single unified approach" in the UK Parliament - MPs would be asked to vote on a series of Brexit options instead which the government "stands ready to abide by", if Labour commits to doing the same. The UK proposes an extension to the process until 30 June, she wrote, and "accepts the European Council's view that if the United Kingdom were still a member state of the European Union on 23 May 2019, it would be under a legal obligation to hold the elections". To this end, she says the UK is "undertaking the lawful and responsible preparations for this contingency". But she suggests the UK should be able to leave earlier, if the UK Parliament approves a withdrawal deal before then, and cancel preparations for the European Parliamentary elections. The EU's chief Brexit negotiator Michel Barnier, at a meeting of EU ambassadors in Brussels, said any extension granted should be the last and final offer, to maintain the EU's credibility. You could almost hear the sound of collective eye-rolling across 27 European capitals after Theresa May requested a Brexit extension-time that Brussels has already repeatedly rejected. Most EU leaders are leaning towards a longer Brexit delay, to avoid being constantly approached by the PM for a rolling series of short extensions, with the threat of a no-deal Brexit always just round the corner. Donald Tusk believes he has hit on a compromise solution: his "flextension" which would last a year, with the UK able to walk away from it, as soon as Parliament ratifies the Brexit deal. But EU leaders are not yet singing from the same hymn sheet on this. Expect closed-door political fireworks - though it's unclear whether it'll be a modest display or an all-out extravaganza - at their emergency Brexit summit next week. Under EU law, they have to hammer out a unanimous position. Talks between Labour and the Conservatives are continuing on Friday. Speaking to Labour activists in Newport on Friday, Mr Corbyn said the government "haven't appeared to have changed their opinions very much as yet". He said Labour would push to maintain the UK's "market relationship with Europe", including defending rights and regulations. Foreign Secretary Jeremy Hunt said the UK still hoped to leave "in the next couple of months" but it may have "little choice" but to accept a longer delay if Parliament could not agree a solution. But Conservative Brexiteer Jacob Rees-Mogg said the EU "should be careful what it wishes for". "If we have EU elections, it is likely UKIP, Tommy Robinson and Nigel Farage will do well," he told BBC Radio 4's World at One. Another Tory Eurosceptic, Sir Bernard Jenkin, said he would prefer to stay in the EU for another year than for Britain to accept a "humiliating defeat" of a withdrawal agreement. The Scottish National Party's Stephen Gethins said that the prime minister's proposal "demonstrates beyond doubt she is putting the interests of her fractured Tory Party above all else". "It is clear that with the UK Parliament unable to reach a consensus - coupled with everything we now know on the damaging impact Brexit will have on the UK economy, jobs and living standards - it must now be the priority that the issue is brought back to the people in a fresh second EU referendum, with the option to remain on the ballot paper."